Thoughts: feeling lots of flutters this week and loving it! Baby boy loves loud music (at church) and Jon has been able to feel a few little thumps here and there. I've had a lot of energy this week for projects around the house and staying up late but noticed that my body fatigues easier and I am not as agile. I've told y'all that pulling weeds is therapeutic for me and I was so excited to do that Sunday afternoon but man I was sore...funny how everyday things can make you sore during pregnancy. Baby: He is the size of a mango this week (about 6 inches and half a pound). His arms and legs are finally in proportion and bone growth is giving him more control over limb movements...meaning more kicks. Kinda gross but this week, a cheesy varnish called vernix caseosa covers his skin to protect it from the amniotic fluid. Last night we read that my uterus is the size of a cantaloupe or larger! Symptoms: Well, as of this morning I was 9 days vomit free and 36 hours Zofran free but baby Hart didn't like that. Unfortunately I got really sick this morning and regretted not taking my nighttime pill. I had been playing with my dosage last weekend and was down to 1/2 pill at night but skipped it last night so it looks like I will go back to that for now. Lots of cramping this week and major tailbone pain. Nose bleeds have been less heavy and frequent which is nice. Weight: I am pretty sure I am up 9lbs which is right on track for where I am. It's all in my belly for now which in turn causes the awesome back pain. Sleep: this past week I've been wanting lots of it. I haven't necessarily been tired during the day but we've been going to bed at 9pm for a solid 9.5 hours. I find myself tossing and turning from one side to the other when the only thing that is comfortable is my back :-(. 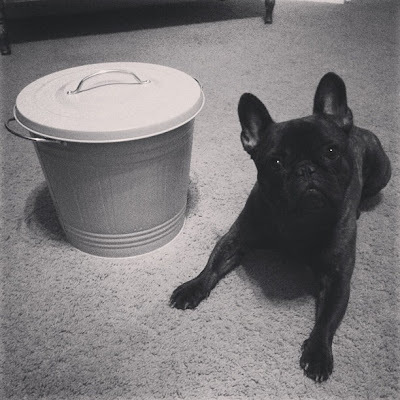 Cravings/aversions/eating: eating has been great this week, last night we had two dinners because about an hour after our first at 6:30p, I was starved. Workouts: good! 3 days of weights and 1 kickboxing class. Even if I am tired and don't want to go to the gym, I feel so good working out and afterward. Clothes: I've been wearing some cute maternity shirts and sometimes my maternity pants but for the most part doing the rubberband trick until I possibly can't do it anymore (which will be soon)! Pants are getting snug, even using the band and I am sad knowing I won't be able to wear any of them in a few weeks so trying to get optimal use. Random: we have a theme going for the nursery with a few items we've been given/bought and I can't wait to share (later this week I hope). Thanks to everyone for their fabric site recommendations, I think we have it nailed down and are going to order soon. 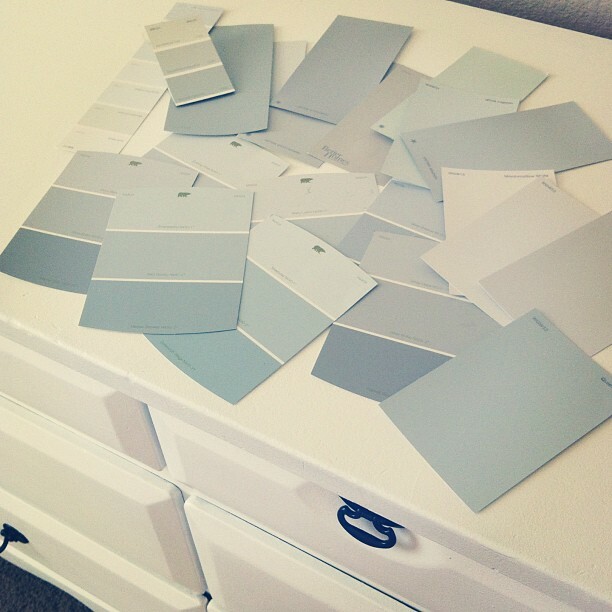 Next up... paint colors! Name: you thought I was gonna tell you that easy?! For the many of you asking, we don't have a name yet but we have narrowed it down to a top 2...names that are actually different than our original list. Choosing a name for the rest of another human's life is HARD! Sorry to break the news but we won't be sharing his name until he is born (we may not actually have it til then!). I told Jon I couldn't get full and of course he talks about our son's calves..
Monday night reading... 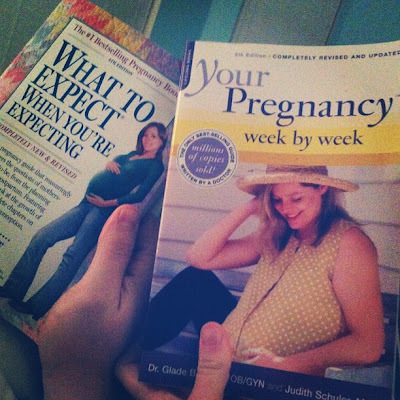 I have to say Jon probably knows way more than I do about the pregnancy, he just gives me the good cliff notes. Are you not supposed to sleep on your back when you're pregnant? I don't know the first thing about pregnancy, which is obvious! I'm going to have to do some major research before having my first! Do you have a pregnancy pillow? I've heard wonderful things about them, especially for back pain. I think keeping the name a secret is a great idea, something only you and Jon can share. I like the paint swatches you posted on instagram, and the new blog design is very pretty! 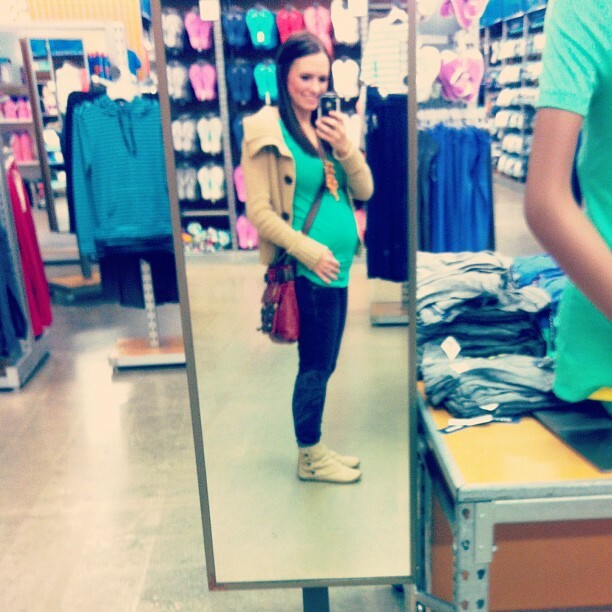 Also, can you believe how small the maternity section is at Old Navy (in store)? At least the one here is, not sure about Austin. Aw, Love the new look Ruthie!! And your belly is super cute! I was going to mention a body pillow or there is a pregnancy pillow...I think they sell it at Toys r us. Sleeping is always the hardest but a pillow will definitely help! You look amazing by the way...way to keep up the workouts! I'm still doing the rubberband trick @ 27 weeks, but just less frequently. It is getting more difficult but I want to keep doing it as long as possible because I don't want to spend loads of money on maternity clothes. Can't wait to see what you will do with the nursery. Where did you order his Toms from? What age will he be able to wear them?!!? Might have to get a pair for our lil' guy! 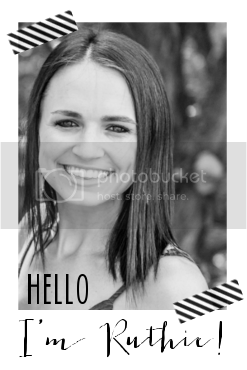 PS...love the new blog design. It's on my to-do list but will have to wait until tax season ends and I have a life besides working! Your new design is SO precious! Love it! And you are just the cutest pregnant, can't wait to hear the name!! I love that Jon reads the books too!!! Hope you have a wonderful week! The new design looks great!!! I love that Jon is reading the books with you! Cute as ever lil miss!!! :) You are just gorgeous, as always!! I hope the nausea continues to subside! The text made me literally laugh out loud- too funny! And those shoes! omg. 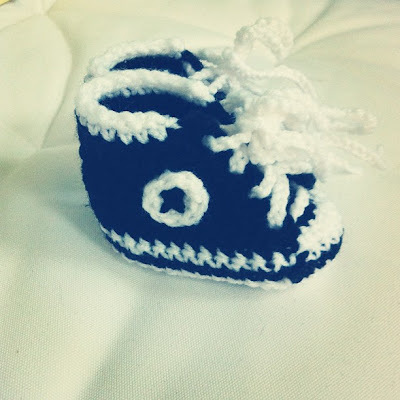 he's going to be the most stylish baby ever. So cute! Loving the new design! You look gorgeous as ever with your growing bump! Can't wait to see more of your little blessing! I need to see that bump in person Ruthie! I love it!!! What to expect is the best. If you don't already have "What to Expect in the 1 year" I'll send you mine. I referred to it ALL the time! The new design looks great!!! Poor Ernie he has no clue whats coming! haha. It will be hard for him at first I bet but the second that baby boy starts walking, wait, better yet, can throw his yellow tennis ball, I think he'll loooove having a baby around to play with. Girl. You're adorable. Only growing in the belly! Lucky girl. Pretty sure these (as in mine) hips are gonna spread! Eek.grr.haha. 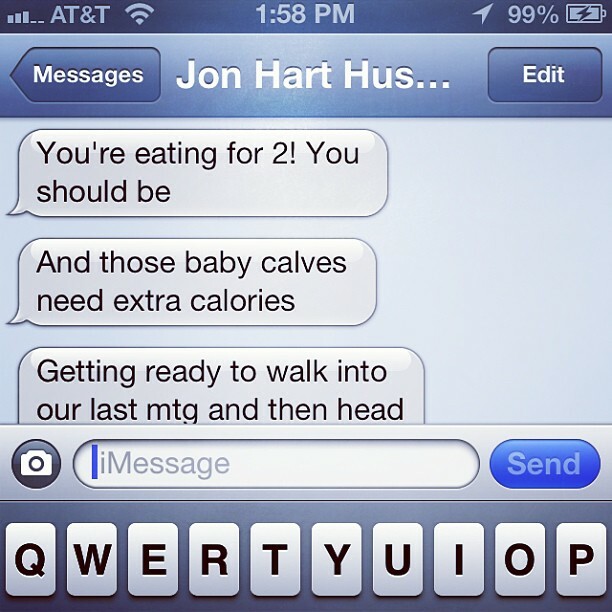 You and Jon are adorable with your texting. I appreciate that you two are keeping your sons name a secret (if you choose one before he's born). It's something so personal and special between just the two of you. I totally LOLed over the calves comment. :) So funny! You look so adorable and I'm glad that you're finally starting to feel better!! You are hands down the cutest pregnant lady. I love seeing these updates. You are so gorgeous!! And your growing tummy! That must be so exciting.